A simple argument is put forth against the idea that the radiative properties of an atmosphere somehow serve as the CAUSE of elevated steady-state planetary surface temps. The presence of an atmosphere on top of a solar-heated planetary surface forces the steady-state temperature of that surface to be higher than if the atmosphere weren’t there, because it acts like a layer of thermal INSULATION interposed between the surface and its ultimate heat sink – space. The surface heat loss will simply always be lower – at any given surface temperature – with an atmosphere on top than without. Even a 100% IR-active atmosphere wouldn’t, however, be able to make any difference whatsoever to the surface temperature if the ATMOSPHERIC temperature were equal to that of space itself. In other words, it is an absolute requirement for the atmosphere in question to be capable of producing an insulating effect on the solar-heated surface at all that it be WARMER than space. What sets an atmosphere apart from the vacuum of space, after all, is its (thermal) mass, making it able to be HEATED by the surface on which it rests, thus naturally allowing it to gain a temperature much higher than that of space and therefore much closer to that of the surface itself. So for any physical property of an atmosphere, if it – on balance – helps in making it warmer than space, if it contributes positively to its net heating, then it effectively acts to promote the atmosphere’s insulating effect on the solar-heated surface below. And so, insofar as an atmosphere’s radiative properties are not contributing positively to the net heating of that atmosphere, they also cannot be CAUSING the atmosphere to exert an insulating effect on the planetary surface. So what is the cause? The atmosphere’s TEMPERATURE is. Those particular physical properties of an atmosphere that actually help making and keeping it warmer than space, that contribute positively to its dynamic net heat budget. The ability to absorb IR photons is not such a property. Because an ability to absorb IR photons is always accompanied by an equal ability to emit IR photons. And so it takes something else, something more, to turn that inherently dual process into a non-zero-sum game and have energy starting to accumulate. Because that’s what we want, that’s what we need. The capacity for holding on to energy, storing it internally over time. Not just the catch-and-release part. The point here is that an atmosphere is good at both catching and releasing energy in the form of radiative heat, but only good at catching energy in the form of conductive heat and evaporative heat (latent heat of vaporisation). Which means that the two latter modes of heat transfer dynamically promote the accumulation of energy within the atmosphere, while the former mode does the opposite. In short, an atmosphere’s IR-active constituents are capable of ridding the atmosphere of excess energy in the form of heat, while its non-IR-active constituents aren’t; they are capable of capturing heat coming in, but not capable of releasing it again. For that, they need their IR-active siblings. What can we read from this? The atmosphere can only be radiatively heated if it is significantly able to absorb radiation. Likewise, it can only radiatively cool if it is significantly able to emit radiation. Our atmosphere on average absorbs a SW heat flux (Qin(SW)) from the Sun worth of 75 W/m2 and a LW heat flux (Qin(LW)) from the surface worth of 32.4 W/m2, totalling 107.4 W/m2, which is quite exactly equal to 49% of its entire heat gain. At the same time, though, our atmosphere on average emits a LW heat flux (Qout(LW)) to space worth of 219.7 W/m2, which makes up 100% of its total heat loss. In other words, our atmosphere’s radiative Qin is less than half as large as its radiative Qout. On average, it cools more than twice as effectively via radiation as it heats via radiation. The non-radiative heat transfer mechanisms, on the other hand, only heat the atmosphere. They don’t cool it at all. On average. This entry was posted in Energy transfer, Greenhouse Effect? and tagged atmosphere, atmospheric mass, Earth's energy budget, greenhouse effect, heat transfer, insulation, IR-active, temperature, thermal radiation. As I see it, your argument boils down to wether or not the IR-active molecules play a zero-sum photon-game. AGW-proponents tend to claim that collisional de-exitation of IR-active molecules are the mechanism behind energy transfer from vibrational states of the IR-active molecules to kinetic translational or rotational motions of non-IR-active molecules, resulting in temperature increase. However, what they hide under the carpet is that non-IR-active molecules colliding with IR-active molecules may equally well excite as de-excite the vibrational states of the IR-active molecules. When excited, the vibrational states of IR-active molecules result in emission of IR-photons. I have asked several AGW-proponents, presumably well-skilled in particle and radiation physics, for physical evidence showing that the collision process between IR-active and non-IR-active molecules results in a net one-way transfer of energy from IR-active molecules to non-IR-active molecules. Nobody has so far presented such evidence. Thus, to my knowledge, your claim that the IR-active molecules play a zero-sum photon game is most probably correct. I think it’s rather obvious that the IR-active molecules WOULD play a zero-sum game of photon absorption/emission if it weren’t for the negative tropospheric temperature gradient. It is the fact that each level of air, as you move up from surface to tropopause, on average has a lower temperature than the one before/below that creates the APPARENT radiative “heat retention” effect, ‘apparent’ because the thermal radiation is not actually what’s CAUSING it; it is itself just an effect of it. This whole issue really boils down to a simple confusion of cause and effect in the Earth system. An atmosphere will increase average temperatures. The Moon which has essentially no atmosphere has higher surface temperature of 120 C when sun is directly above the surface. Earth atmosphere blocks about 300 watts of direct sunlight, with clear sky and sun is directly above the surface. Space is very low density of atoms [these atoms are traveling very fast], space has no air temperature because lacks “air density”. All planets with an atmosphere with have a thermosphere- it’s when density of atmosphere is very low- and like space it has no air temperature. Anyhow one could have CO2 only atmosphere and depending size of atmosphere such a pure CO2 atmosphere could like Earth’s atmosphere, block about 300 watts of the direct sunlight. And this result in lower surface temperature. With earth the surface could warm to about 80 C and likewise with pure CO2 which blocked 300 watts, it would only warm to about 80 C.. So argument is radiant properties of greenhouse gases are a cooling effect. I think don’t think greenhouse gases have a cooling effect. And I also don’t think greenhouse gases radiant effect causes 33 K of warming of Earth- I think it’s 1/2 of 33 K [or less]. I would say that the CO2 of Venus and Mars, doesn’t cause cooling of these planets- though I don’t think the CO2 of these planets have much of warming effect. With Mars I think there is mostly a warming effects of CO2 because of latent heat of CO2 when snows out of atmosphere in the poles during winter- though the radiant effect in near zero. With Venus, I don’t have much of opinion of how much warming effect is due the radiant effects of the CO2, though probably more than Mars, But has little to do with accounting for Venus high temperature. What seems like unknown factor for me is the CO2 at critical temperature and pressure where it’s at 72 atm or more or when CO2 in quasi liquid state. But I think main factor related to Venus high surface temperature is related to it’s clouds. In terms of radiant effect of greenhouse gases, I believe it occurs at low elevation. Or say when air density is about 1 kg per cubic meter or more. Mars of course doesn’t have anywhere near this density- it’s around ,02 kg per cubic meter. You did read my post, right? The strictly radiative properties of the IR-active constituents of our atmosphere (they are NOT “greenhouse gases”!) definitely help cool the atmosphere – on balance. They ALSO aid in heating it, but their cooling effect is much stronger. As you can easily read from any Earth energy budget. Our global atmosphere is – on average – heated by a total radiative flux of [75+32.4=] 107.4 W/m^2, but is simultaneously cooled by a radiative flux of 219.7 W/m^2. Both fluxes are a direct result of our atmosphere’s distinctly radiative properties. So the radiative cooling of the atmosphere (Q_out(rad)) is more than twice as strong as the radiative heating (Q_in(rad)). It is very much the other way around for the surface. It is heated by a radiative flux (from the Sun) of 165 W/m^2, but is only at the same time cooled by a radiative flux (to the atmosphere and space) of a mere 52.4 W/m^2, so the radiative heating of the global surface is on average more than three times as strong as the radiative cooling. I would say CO2 counts as greenhouse gas and also is “IR-active”. One could say clouds are “IR-active constituents of our atmosphere ” and not gases or subset of gases which are greenhouse gases. I don’t think clouds or gases cool the atmosphere due to them being IR-active. I would say surfaces warm and cool. Though one could call clouds a surface, but Earth’s main surface is it’s ocean surface, and Earth’s land surface does most of cooling of Earth. Earth’s land surface provide highest temperature and highest surface air temperature, but land surfaces don’t increase earth’s global temperature, rather they decrease earth’s global temperature. Earth’s average land temperature is about 10 C and ocean surface temperature is about 17 C. Land surfaces have regional effect and oceans have a global effect. Even if Earth had 70% of surface being land and 30% ocean, land would cool the global temperature and ocean would warm the global temperature, of course since ocean are 70% of earth surface it warms more as compared to a planet with only 30% of surface being ocean. Earth oceans have global effect rather than regional like land, because ocean absorb more of the sun’s energy and prevented from having a high surface temperature, because it evaporates. So ocean absorbs 1120 watts and land absorbs 1050 watts at noon, sun at zenith, and a clear sky. And when you have clouds and sun is further from zenith, one gets a more higher ratio of indirect sunlight as compared to direct sunlight. And the temperature of the air above ocean is close to surface temperature [because of evaporation]. Land surface [unless there are wet] have a wider differences of temperature between ground and air above it. So oceans control global surface air temperature, and surface air temperature controls the temperature of air above it. [and air above controls the surface air temperature- global ocean controls air temperature above land surface air- or if you could *somehow* prevent the global air which is warmed by ocean surfaces from warming land surface air, then land surface air would be colder than it’s average of 10 C].]. has temperature of about 5 C.
Now the ideal conductive body conducts heat to night side of sphere, and it would easy not to conduct the heat to night side [the hard part of magic of ideal thermal conductive blackbody is conducting the heat to night side -and providing a uniform emission of energy, everywhere]. absorbs on average 680 watts per square meter and emits 680 watts per square meter- giving uniform day side temperature of 330.9 K [57.75 C]. where the sun is closest to zenith- noon and near equator and least near sunrise and sunset- and nearer poles [at all times]. in terms of ideal thermal conductive blackbody, Earth day in sunlight could get quite warm, particularly in the tropics [though night side is very cold]. Or in terms of understanding Earth’s average temperature, the question is how does nights and poles be as warm as they are. And answer is earth ocean warm these areas. Since the atmosphere’s “TEMPERATURE” is what causes the atmosphere to have it’s insulating property, that means that all of the constituents of the atmosphere which have thermal mass, ie. the N₂ & O₂ & Ar which make of 99.7% of the atmosphere’s capacity to store thermal energy, are what make the greenhouse “effect” work to keep the earth warmer than it would be without an atmosphere. The science of the atmosphere shown here: http://www.calqlata.com/Maths/Formulas_Atmosphere.html confirms this. The N₂ & O₂ & Ar in the atmosphere is part of that “everything on Earth”, so they also emit EMR. The N₂ & O₂ & Ar gases in the atmosphere contain thermal energy, so they do radiate because they are at the same temperature as the CO2 molecules and because they are above absolute zero temperature. This thermal mass is what makes up the TEMPERATURE which acts as insulation and reduces the rate of heat loss from the surface compared to what it would be without an atmosphere. q=ϵσ(Th⁴-Tc⁴). The ~255K Tc of the atmosphere makes q lower than if Tc were ~0k without an atmosphere. It’s only in the upper atmosphere when there are few surrounding N₂ & O₂ & Ar to collide with that the radiatively active gases have enough time to re-emit absorbed LWIR, and transfer heat to colder space, not to the warmer surface of the earth. That’s when the radiatively active gases do their work of cooling the planet. And there is no thermal energy transferred from the cold atmosphere to the warmer surface like the climate alarmist claim. 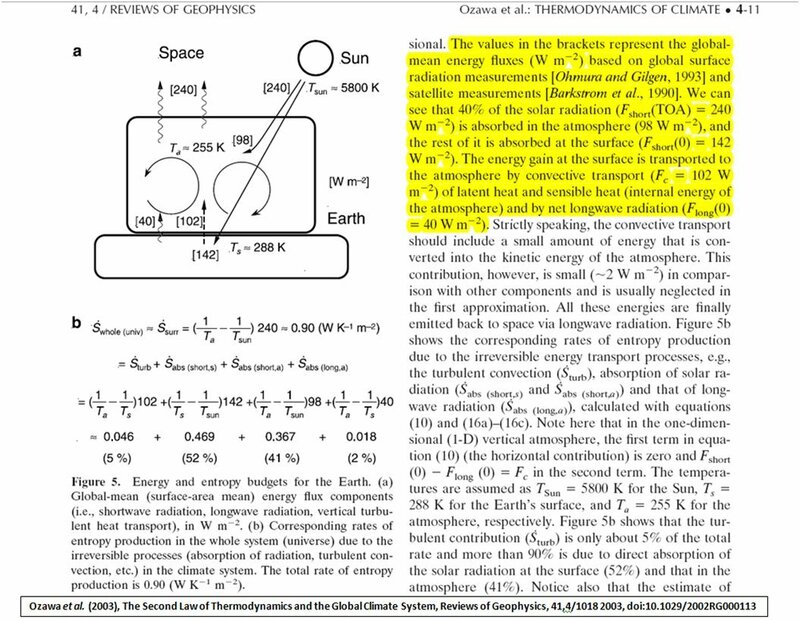 This peer reviewed paper which was written expressly from the perspective of the 2nd Law of thermodynamics and the global climate system shows that: https://a.disquscdn.com/uploads/mediaembed/images/3163/2606/original.jpg There is no energy flux from the atmosphere to the surface. Perhaps you could elaborate on how the following formula is derived in the absence of bidirectional energy transfer? Define what you mean by “acts like”. * If you mean the atmosphere literally *is* a layer of insulation limiting the *conduction* of heat from a planetary surface to space, that is clearly wrong. There is no conduction from a planet to space. * Perhaps you mean the atmosphere is simply analogous to insulation. Insulation limits thermal conduction from warm house to cold winter air; an atmosphere limits thermal radiation from warm planet to cold space. Of course, this is now simply the standard explanation of the GHE in terms of radiation. Until you can give a clear definition of what you mean by “acts like” (ideally with an equation), there is no point delving deeper. Insulating the surface of the Earth, thus making IT warmer, is not about limiting the thermal radiation flux from Earth as a whole to space. It’s about limiting the heat loss of the SURFACE to ITS immediate thermal surroundings. You know this, Tim. So stop playing the stupid game. #1 is barely true. If the atmosphere were 100% argon it would emit so little radiation at the temperatures in question that temperatures would almost be as if there were no atmosphere. The vast majority of the radiation emitted by the surface would escape directly to space. #2 is true. The greenhouse effect requires a lapse rate. #3 is either wrong or irrelevant. Again, an argon atmosphere would have little effect on surface temperatures, yet it would have heat content and be approximately the same temperature as the surface near the surface and cool going up into the troposphere. #4 – OK. Not sure what point is being made here. The only way that the planet loses energy to space is via radiation. #5 is flat out wrong. A planet with an atmosphere without IR active components radiates energy to space directly from the surface. Hence the surface temperature would be essentially equal to the case with no atmosphere. #6 does not follow given the errors pointed out above. Just to clarify, an argon atmosphere would act to reduce the diurnal temperature difference with respect to the no-atmosphere case, so the average surface temperature would be slightly higher than the no-atmosphere case but still far less than if the atmosphere were IR active. An atmosphere definitely needs to be IR active in order for it to be thermodynamically connected to the surface, to make heat flow into, through and out of that atmosphere, even in a steady state. But it is the atmospheric temperature being above that of space that is the ultimate reason why the surface temp ends up higher than if the atmosphere weren’t there. The thermal radiation is merely a connecting TOOL, a carrier of temperature signals, not itself a cause of temperatures and temperature changes. It controls nothing, thermodynamically. It is itself controlled. The simple fact that the atmosphere is able to warm and thus ends up considerably warmer than space is the ultimate reason why the steady-state temperature of the surface below is higher than if the atmosphere on top of it weren’t there. It’s called insulation. The radiative properties of an atmosphere do not cause its insulating effect. They don’t even help. They ONLY help to keep the surface and the atmosphere thermodynamically (thermally) connected even after a steady state has been reached. Other than that, all they do is letting the atmosphere COOL. Preventing it from over-heating. The atmosphere’s insulating effect is rather caused by the simple fact that it’s made up of matter, that it has a ‘thermal mass’, that 1) can absorb energy in the form of heat, and 2) can hold on to that absorbed energy, enabling it to remain at an elevated temperature. That’s a rather nonsensical claim. An argon atmosphere would be physically connected to the surface and would be able to transfer heat to and receive heat from the surface via conduction. Electromagnetic radiation would flow through and out of such an atmosphere even if it is not IR active. where α is the albedo, and ε is the effective broadband emissivity for the surface for longwave radiation. The equality is only realized when there is no diurnal temperature variation. Again, this is for a planet with an atmosphere that is not IR active. We can take an all argon atmosphere as a good approximation to this. This is yet another non-scientific statement. Radiation is governed by the laws of physics. The amount of energy into a system minus the amount of energy out of a system is balanced at steady state. Without an IR active atmosphere the equation that I gave above give the maximum average temperature. Do you agree or not? Wrong again. An argon atmosphere is able to warm, yet it would not be able to cause the surface temperature to be above the value in the equation above. This appears to be an argument over semantics. If insulation is a resistance to heat flow, then the radiative properties of the atmosphere certainly do cause an insulating effect. Take a look at Holman's book on heat transfer if this is a new concept for you. Again, this statement is wrong. An argon atmosphere does not elevate the average surface temperature above the value of the equation given above. In fact for a quickly rotating planet with a large thermal mass (i.e. the diurnal temperature variation is nearly zero), an argon atmosphere would have nearly zero effect. My new understanding is not really new. It's still clear that the TP is wrong. Why don't you try to put some math behind your statements for an argon atmosphere? Not the bulk atmosphere (above a narrow surface boundary layer) after a steady state has been reached. It seems you don’t understand what I’m actually talking about. Indeed. But it would effectively be thermodynamically/thermally disconnected from the surface in the steady state. where α is the albedo, and ε is the effective broadband emissivity for the surface for longwave radiation. The equality is only realized when there is no diurnal temperature variation. Again, this is for a planet with an atmosphere that is not IR active. We can take an all argon atmosphere as a good approximation to this." Sure. But, again, it seems you haven’t grasped the actual argument made in the TP. You’re putting all your effort into countering a straw man argument. Agreed. I have never claimed otherwise. Please move on. You need to read the TP properly in order to understand the actual argument being made. An atmosphere needs to be both IR active and warmer than space in order for it to be able to raise the average surface temperature. The IR activity is a given. It is a necessary TOOL, but it is not the CAUSE of temperature and temperature changes. No. Read the TP. The atmosphere’s thermal radiation only APPEARS itself to be what resists the heat flow because the atmosphere happens to be warmer than space. The atmospheric IR that we detect is simply an expression of atmospheric temperature (and emissivity). It is there because of temperature. It is the atmosphere’s TEMPERATURE being higher than that of space, however, that is the root cause of the effect. The atmosphere’s radiative properties, in and of themselves, did NOT help in making the atmosphere warmer than space. Because, on balance, they exert a strong COOLING influence on the atmosphere. On average, they help the atmosphere absorb 107.4 W/m^2 worth of heat (directly from the Sun and from the surface), but at the same time, they let the atmosphere emit 219.7 W/m^2 worth of heat (to space). Which means the purely radiative heating of the atmosphere is less than half as intense as its radiative cooling. And all of this you can read about in the TP. How about we try to simplify this to see if we agree on a basic point? Let’s say we could turn the IR activity of the atmosphere off. Would the average temperature of the surface increase, decrease, or stay the same? Is this semantics again? How narrow a surface boundary layer are you envisioning? There is either heat transfer occurring or there is not. If the argon atmosphere is reducing the dirunal temperature variations then there certainly is heat transfer occurring. By the way, I did forget to metion any latitudinal variations in temperature that would occur. An argon atmosphere would also act to reduce those temperature differences as well. Temperature differences cause density differences, which in general lead to atmospheric currents. The only way that an atmosphere would not be transferring and absorbing heat from the surface is if the surface and the atmosphere had homogeneous temperature distributions. You do understand that the “steady state” we are discussing includes a day side and a night side right? An IR-inactive atmosphere will have heat transferred to it when the sun is warming the dayside surface and it will transfer heat to the night side as that side cools due to radiative heat loss to space. The net of these two processes will be a zero net heat transfer from the surface to the atmosphere over the course of a periodic cycle. Perhaps not. Are we in agreement that without an IR active atmosphere the average surface temperature cannot be higher than [ (1–α) q_sun / 4 / σ / ε ]^0.25? If so, then that means that the only way to achieve a higher average temperature is if the atmosphere is IR active. That means that IR active atmosphere cause the average surface temperature to be higher than the case without an IR active atmosphere. You need to define what you mean by “thermodynamically/thermally disconnected”. As far as I can tell this is utter nonsense. An argon atmosphere transfers heat to and absorbs heat from the surface via conduction. How is that not “thermodynamically/thermally connected”? If you agree that only an IR active atmosphere can cause the average surface temperature and the near surface atmospheric temperature to be higher than [ (1–α) q_sun / 4 / σ / ε ]^0.25, then your claim that “insofar as an atmosphere’s radiative properties are not contributing positively to the net heating of that atmosphere, they also cannot be CAUSING the atmosphere to exert an insulating effect on the planetary surface” is refuted. If you agree with this, then what is there to move on from? Your claims are refuted. Yes, it does. Glad we agree. Of course is is the CAUSE of the temperature changes. You just admitted that without the IR activity there would be no temperature change. Are you having trouble understanding cause and effect. Let me try to simplify it for you. Take a planet without an atmosphere, add a non IR-active atmosphere to it, and we agree there is virtually no temperature change. Now, change out that non IR_active gas for one that is IR-active, and we agree that the temperature increases. The CAUSE of the temperature increase was the IR-activity of the atmosphere. Um yeah, the fact that you capitalized “APPEARS” is confirmation that this is an argument over semantics. Insulation in heat transfer can simply be defined as a resistance to heat flow just like a resistor in an electrical circuit can be defined as a resistance to current flow. For the heat transfer case the “resistance” gives the possibly non-linear relationship between the heat flow through the medium and the temperature drop across the medium (analogous to current and voltage drop). Agreed. It’s good to see that you acknowledge that the colder atmosphere does in fact emit IR that is absorbed by the warmer surface. Warmer than space? Who cares? The IR properties make the atmosphere and the planetary surface warmer than [ (1–α) q_sun / 4 / σ / ε ]^0.25. Again, let me remind you of what you have already agreed to. The only way that the surface and the attached atmosphere can be warmer than [ (1–α) q_sun / 4 / σ / ε ]^0.25 is due to the radiative properties of the atmosphere. Hence, it is in fact the atmosphere’s radiative properties that causes both the surface and the atmosphere near the surface to be warmer than [ (1–α) q_sun / 4 / σ / ε ]^0.25. If the IR properties exert a strong cooling effect, then turning them off should cause warming right? Yet you’ve agreed that this is not what would happen. On balance, the IR properties make the atmosphere near the surface WARMER than [ (1–α) q_sun / 4 / σ / ε ]^0.25. In fact, if it weren’t for the non-radiative transfers occurring between the atmosphere and surface and within the atmosphere itself, then the surface and atmosphere would be even warmer due to the IR properties of the atmosphere. Again, I’ve read the TP. Reading it again does not change the fact that you are confused and are making contradictory remarks. This entire issue is about semantics, Rocky Squirrel. In other words: If we don’t go by the correct, agreed-upon term or definition for any specific physical phenomenon or process that we want to describe and explain, then this will ultimately prevent us from understanding what that physical phenomenon really is and how that physical process really works. We will end up confusing ourselves and/or the people we’re trying to communicate with. We want to find the rightful owner of the term “CAUSE” concerning the process of atmospheric insulation. This is at the same time a semantic issue AND a physics issue. Only the actual physical cause can and should be given and carry that particular designation. Your writings are for the most part completely irrelevant to this issue, Rocky Squirrel. It is NOT about whether or not an argon atmosphere could make the surface warmer or not. Yes, you repeat this statement, yet a simple application of logic to your other statements refutes it. Let me try again with this simple thought experiment to try to get down to brass tacks. Yes, you repeat this statement, yet a simple application of logic to your other statements refutes it. Hehe, no, it’s exactly the other way around. This nonsense argument of yours (“let’s say we could turn off the atmospheric IR activity”) is easily refuted by mine. For the nth time: YES, THE ATMOSPHERE NEEDS TO BE IR ACTIVE IN ORDER FOR ITS TEMPERATURE TO HAVE AN EFFECT ON THE SURFACE TEMP. That is not to say that the IR activity is thereby the cause of this effect. You obviously don’t even understand my argument. You claim to have read the TP, but in what you write, you show no evidence whatsoever of having actually grasped what it says. We are not discussing the necessity of atmospheric IR activity. It is necessary. We are discussing the specific ROLE it has in the physical process that raises the average surface temperature of the Earth above that of pure solar radiative equilibrium. It is the cause. It’s as if you live in some alternate universe where logic does not apply. The temperature of the surface is X without IR activity in the atmosphere. The temperature of the surface is Y with IR activity in the atmosphere. Hence IR activity CAUSES the difference in temperature from X to Y. This really isn’t a difficult concept. Haha, you are a stubborn guy, aren’t you? In what way can it be the cause of surface warming when it clearly works to make the atmosphere cooler, not warmer? I mean, who’s living in an alternative universe, where the laws of logic apparently don’t apply? It is merely a TOOL wielded BY the actual cause. It is not itself the cause. I’m getting tired of this argument. Do you have anything else to say? Something of substance? Or will you just repeat your nonsense “let’s say we turned off the atmospheric IR activity” argument? Apparently not as stubborn as you. IR activity does not make the atmosphere cooler. It makes it warmer. You’ve already agreed to that fact. Have I? Where? When? Did you read the TP? Do you even understand thermodynamic principles? In what way does an atmosphere’s IR activity make that atmosphere warmer and not cooler, Rocky Squirrel? How is this a “fact”? Please enlighten me. You agreed that if the atmosphere is not IR active the average surface cannot be higher than [ (1–α) q_sun / 4 / σ / ε ]^0.25, and if the IR activity of the atmosphere is turned on then the temperature will be higher than this. Hence, the IR activity of the atmosphere caused the surface temperature to warm. Additional details of the changes to the energy fluxes that turning the IR activity on are included below. Again, why don’t you address the simpler system of Eisenbach’s steel greenhouse? Does adding the shell around the core cause the core to warm? Are you familiar with Willis Eisenbach’s steel greenhouse? If so, I assume that you agree that the temperature of the core without the surrounding shell is lower than the temperature of the core with the surrounding shell. So, does adding the surrounding shell cause the core to increase in temperature? Are you familiar with Willis Eisenbach’s steel greenhouse? If so, I assume that you agree that the temperature of the core without the surrounding shell is lower than the temperature of the core with the surrounding shell. Yup. Of course it does. Once again, it’s called insulation. Still not the bone of contention, though. You’re still debating a straw man. That’s good that you are able to admit that. So, placing the shell around the core caused the core to warm. Just like placing an IR active atmosphere around a planet causes a planet to warm. If you call the shell insulation, then you should also be calling the IR active atmosphere insulation. Haha, you are completely blind to the cause/effect relationship here! You consistently turn it fully on its head, and you’re simply incapable of spotting it yourself. You mean like when you use your “thermodynamically/thermally disconnected” nonsense to describe matter that is in physical contact with other matter? Were you ever planning to define what you mean by that quoted phrase, or have you managed to so thoroughly confuse yourself that you have decided to avoid it? No. When two systems are thermodynamically/thermally connected, they are not merely in “physical contact”. It means they are able to transfer macroscopic fluxes of energy to one another and to (thus) thermally affect the other. This is pretty basic stuff, Rocky. Any two systems of matter that are in physical contact are able to transfer fluxes of energy to one another. Have you ever heard of conduction? It is trivially basic stuff. Why are you not able to understand it? This is really getting quite ironic. You do realise how you’re specifically arguing against your own “let’s say we turned off the atmospheric IR activity” argument here …? How so? Your ignorant claim that an argon atmosphere would be “thermodynamically/thermally disconnected” from the surface is what is being refuted here. Turning on or off IR-activity does not change the fact that any atmosphere is able to transfer energy to and receive energy from the surface via conduction. How does that refutation change the fact that the IR activity of the atmosphere causes the surface to be warmer than if the atmosphere were not IR active? So you do not realise it. Given that I understand the physics at play here and you do not, I don’t see what there is for me to realize. You are trying to claim that two systems of matter in physical contact, that are conducting heat to and from one another, are somehow “thermally/thermodynamically disconnected”. If you don’t realize how absurd your claim is then we certainly do have a pretty hard row to hoe here. Your ignorant claim that an argon atmosphere would be “thermodynamically/thermally disconnected” from the surface is what is being refuted here. It would be, AFTER A STEADY STATE HAS BEEN REACHED. Not before. And I’m talking about the bulk atmosphere, that part which would be situated above the shallow, diurnally fluctuating boundary layer closest to the actual surface, separated, basically, by a low-altitude tropopause. That bulk atmosphere would effectively not be able to thermally affect the the average state of the surface, just as the surface would likewise effectively not be able to thermally affect the average state of the bulk atmosphere, after a steady state of dynamic equilibrium had been established. Because they would effectively be convectively disconnected. Turning on or off IR-activity does not change the fact that any atmosphere is able to transfer energy to and receive energy from the surface via conduction. Yes, that would happen between the surface and the shallow boundary layer right on top of it. Even convection would work here. This shallow layer of air would develop a positive temperature gradient at night (turning into an inversion layer), but with the solar heating of the surface during the say, this gradient would be turned negative. Again, I’m not talking about this shallow layer. I’m talking about the bulk atmosphere resting on top of it, and separated from it by an effective ‘tropopause’ boundary. The surface boundary layer and the bulk atmosphere above would in principle be thermally connected in the same way as Earth’s troposphere and stratosphere are connected across the real tropopause – for all intents and purposes, not at all. I’m not saying they’re hermetically sealed off from one another, not at all, but the thermal exchange is so minor overall that it can easily be neglected in any general heat transfer budget overview of either. It doesn’t. An atmosphere’s IR activity isn’t what causes the surface underneath to be warmer. The atmosphere’s temperature above that of space is the cause. The IR activity does not create that temperature, and it certainly does not make it higher than that of space. On balance, it COOLS the atmosphere. The atmosphere’s thermal radiation is just an effect, an expression, and a connecting tool, of the atmospheric temperature. You are yet again wrong. At steady state, the atmosphere would absorb energy via conduction from the surface during the day when the surface is warmer than the adjacent atmosphere, and it would transfer energy to the surface via conduction during the night when the surface is warmer than the adjacent surface. This type of transfer would also occur from the equator to the poles. The net over the periodic cycle is zero, but the two systems are always interacting thermally/thermodynamically, as energy is constantly be transferred to and from each system. Just admit your error already so we can move on. Wrong again. A non-IR active atmosphere has a temperature above that of space and it does not cause the surface to warm. You really have a problem understanding cause and effect. Here Q_surf is all non-radiative energies from the surface to the atmosphere. The negative sign means that the atmosphere is transferring energy to the surface. Just below, Q_atm will be the non-radiative energy absorbed by the surface from the atmosphere and will always be the opposite of Q_surf. So, all energy fluxes balance and if we approximate the planet as a blackbody, its temperature will be approximately 255K. So, turning on the LW activity has caused the surface temperature to increase to 289K, and the non-radiative transfers to have switched sign and now go from the surface to the atmosphere instead of from the atmosphere to the surface. This means that the atmosphere was actually slightly warmer on average than the 255K surface originally to allow for the 75 W/m^2 of heat transfer (by about the same amount as it is slightly cooler now to allow for the 112 W/m^2 of heat transfer). Turning on the LW activity of the atmosphere has also caused the energy absorbed by the surface to increase from 240 to 510, which in turn means that the surface has to increase in temperature in order to be able to both radiate more energy out and conduct/evaporate more energy out via latent and sensible heat. The one effect that you are interpreting as warming the atmosphere, i.e. the sensible and latent heat, was caused to change from a net cooling effect to a net warming effect by the LW activity of the atmosphere. There is really no way around the conclusion that the LW activity of the atmosphere causes the surface to warm. Unless of course you want to change the meaning of the word “cause“. I think that I might see where your confusion lies. I’m not confused about this. So I’m afraid I don’t need your help, Rocky Squirrel. It has to do with the transient versus steady state. Nope. But by all means, give it a try. We can really only see the cause clearly if we look at how the energy flows change during the transient, i.e. from when the system goes from a cooler state to a warmer one. Sure. But your analysis totally confuses cause and effect. We now place a massive – and very much radiatively active! – atmosphere on top of this equilibrated planetary surface. Now, just as the surface before it could be considered to start its original journey toward its original steady state temperature (269 K) from a hypothetical initial temperature around absolute zero (or 2.7 K, rather), so could the atmosphere. We simply want to see what happens as energy accumulates inside this massive atmosphere, gradually warming it. So to begin with, before any energy has managed to be transferred as heat from the surface to this new atmosphere, the surface radiant heat loss is: q/A = σ (T_sfc^4 – T_atm^4) -> σ (269^4 – 2.7^4) -> 296 W/m^2, IOW just what it was before the atmosphere was placed on top of it. And remember now, this is a fully radiatively active atmosphere – it is able to absorb and emit EM radiation. The only problem is that it’s still too cold. But what happens as this atmosphere now absorbs more and more energy from the surface (and from the local sun), thermalising it and gradually warming from it? Its temperature rises beyond that of space itself. And as a simple consequence of this, the atmosphere is now turned into an insulative layer, basically interposing a thermal barrier between the solar-heated surface and the absolute coldness of space. As the atmosphere warms, its apparent DWLWIR to the surface increases. But the atmosphere warms, not from apparent, thermally generated ‘radiant fluxes’, but from the absorbed and thermalised energy transferred to it as heat from the surface and directly from the sun. And what happens when the surrounding temperature of a constantly heated object/surface all of a sudden increases? The temperature difference between the object/surface and its surroundings is reduced. And what does this lead to? It leads to a reduction in the rate of “heat loss” from the object/surface in question. This is true whether the mode of heat transfer happens to be ‘radiative’, ‘conductive’ or ‘convective’. And so, if we assume that the rate of incoming heat to the object/surface remains unchanged, then energy will accumulate (because Q_in > Q_out) and the object/surface will necessarily warm as a result, until its heat balance is restored (Q_in = Q_out). And what happens when the surface temperature rises as a consequence of this process? Its apparent UWLWIR increases. Which makes the (radiant) heat loss rate (DWLWIR minus UWLWIR) of the surface go up again. And so the surface radiant heat loss rate itself could theoretically stay constant during the entire warming process towards the new steady state temperature. It would be 296 W/m^2 in the initial state (296W/m^2 – 0W/m^2, 269 vs. 2.7 K), and it could be 296 W/m^2 in the final (steady) state also (say 398W/m^2 – 102W/m^2, 289 vs. 206 K). The thing is, though, that once the massive atmosphere is put on top of the solar-heated surface, then the whole surface situation changes. Moving towards the new steady state, the atmosphere will 1) make the planet’s albedo increase substantially, and 2) absorb for itself a significant portion of the incoming heat input from the sun, so that it never manages to reach the actual surface at the bottom. This will reduce the average ASR at the surface from the original no-atmo value of 296 W/m^2 to a final +atmo value of a mere 165 W/m^2. Which would mean that about 44 % (!) of the original solar heat absorbed by the global surface is now somehow made unavailable to it by the very presence of the radiatively active atmosphere resting on top of it, either reflecting it back out to space or absorbing it for itself, before it could ever reach the surface. This situation alone would reduce the potential steady-state surface radiant heat loss from 296 to a maximum of 165 W/m^2. But would it thereby necessarily change the surface T_avg also? No. Because the radiant heat loss (the net LW) is only constrained by the effective temperature DIFFERENCE between the surface and the atmosphere, not by the individual effective temperature of the surface and/or the atmosphere. So we could theoretically go from 296 minus 0 W/m^2 (net LW: 296 W/m^2) in the initial steady state (at 269 vs. 2.7 K), to 296 minus a potential 131 W/m^2 (net LW: 165 W/m^2) in the final steady state (at 269 vs. 219 K). However, it doesn’t end there. You see, more things change at the surface once the massive atmosphere is put on top of the solar-heated surface than just the total heat balance (moving from Q_in(296W/m^2)=Q_out(296W/m^2) to Q_in(165W/m^2)=Q_out(165W/m^2)). The surface heat budget after all also stops being a purely radiative one. And this fact is an extremely important one to appreciate, because it has obvious implications for the surface radiant heat loss, which used to make up 100 % of the total. It won’t anymore. It will naturally have to “make room for” other losses, NON-radiative ones. IOW: It will, by physical necessity, become significantly smaller. Even without any increase in atmospheric IR opacity. And so this really changes the whole narrative. The surface radiant heat loss ISN’T reduced because of a rise in the effective atmospheric temperature leading to a rise in apparent atmospheric DWLWIR to the surface. It is simply reduced because there is less ‘need’ for it, because other heat loss mechanisms than the radiative one are also now contributing to the total. So you see, the absolute magnitude of the surface radiant heat loss is thoroughly constrained first by the heat INPUT to the surface (the ASR), then by the (effectiveness of the) other heat loss mechanisms at work. It can’t be determined simply according to some perceived atmospheric level of IR opacity. In the end, we might have a situation where, after having emplaced a massive atmosphere around our hypothetical planet, the surface steady state corresponds to a Q_in = Q_out of only 165=165 W/m^2 (rather than one of 296=296 W/m^2), where the radiant part is further reduced to, say, 53 W/m^2. And so we’re left with the following inescapable apparent DWLWIR-UWLWIR relationship: 398 – 345 W/m^2 (net LW: 53 W/m^2), at 289 (T_sfc) vs. 279 K (T_atm). The thing is, then, that this doesn’t tell us anything at all about how we got from a surface T_avg of 269 to one of 289 K. Nothing about physical causes. All it really tells us is that a) the surface steady-state T_avg happens to be 289 K, and that b) the surface steady-state radiant heat loss happens to be 53 W/m^2. 289 K -> 398 W/m^2, and 398 – 53 = 345 W/m^2. This is exactly how a pyrgeometer would compute the apparent “sky radiation” (DWLWIR). But it tells us nothing about why the radiant heat loss happens to be 53 W/m^2 and not some other value, nor why the surface T_avg happens to be 289 K and not higher, not lower. Remember how, when we first placed the atmosphere on top of the solar-heated surface, the heat input to the surface from the sun was 296 W/m^2, and there were no other heat loss mechanisms in operation except the radiative one. Moreover, the no-(or pre-)atmo steady state surface temperature was 269 K (296W/m^2 IN = 296W/m^2 OUT), and this was also the initial situation as the massive, radiatively active atmosphere (at 2.7 K) was placed around the planet – the DWLWIR was practically zero, because the atmosphere was too cold. Then several things happened: i) the atmosphere started warming (from absorbing energy transferred to it as heat), ii) the heat input to the surface was reduced, and iii) other heat loss mechanisms beside the radiative one became available and operative as the system kept growing warmer (a direct result of the warming atmosphere). And so, from the initial to the final steady state, we went from a surface net LW (radiant heat loss) shedding 296 W/m^2 to one at a mere 53 W/m^2. Meaning, we went from a temperature difference of [269-2.7=] ~266 K between the surface and the APPARENT “effective atmospheric level of downward radiation” to one of [289-279=] 10 degrees. Does this mean that the atmosphere somehow got immensely more opaque to surface IR, lowering the effective level of “sky radiation” to the surface by this huge amount, during the journey from t_i to t_f? No, of course it doesn’t. The atmosphere was just as IR active the entire time. The increase in DWLWIR is an apparent radiative effect of the atmosphere warming. When the atmosphere warms beyond space, from absorbing, thermalising and storing up energy transferred to it as heat from the surface and directly from the sun, the temperature difference between the surface and its surroundings decreases, and so its total heat loss is naturally reduced. This forces the surface to warm so as to restore its heat balance (the heat input is assumed constant). Yes, if the atmosphere in question is completely radiatively inert, it (or the main portion of it) will eventually be thermally disconnected from the surface, and so space can still be considered the surface’s only significant cold reservoir. But as soon as you make the atmosphere radiatively active, you will have that thermal connection with the surface established, just like when engaging a ‘clutch’, connecting engine power and mechanical work output, ENABLING causation to occur, and so now the atmospheric temperature will directly affect the total heat loss from the surface, which will be greatly reduced at any given surface T_avg relative to the former situation, once the atmospheric T_avg rises above the ‘temperature’ of space. You might fool yourself into thinking that it is in fact the increase in the apparent atmospheric DWLWIR itself that forces the surface temperature to rise in this situation. But it’s not. The absolute rise in TEMPERATURE is the cause. The DWLWIR is but a tool enabling the atmospheric temperature to connect with the surface temperature in the first place. When the atmospheric temperature rises in this situation, it will then simply be able to affect the surface temperature, because now the atmosphere thermally connected with the surface, and so it effectively replaces space as the surface’s thermal surroundings, meaning that, as it warms, the temperature difference between the surface and its surroundings goes down (this couldn’t happen with only the vacuum of space around, since a vacuum cannot warm). And as the temperature difference between the surface and its surroundings goes down, there will be a decrease in both radiant, conductive and evaporative/convective heat loss from the surface. Forcing the surface temperature to rise. The increase in DWLWIR is simply one expression of this decrease in temperature difference between the surface and its surroundings, thus of the reduction in surface heat loss. The steady-state magnitude of the surface radiant heat loss is to a certain extent simply a function of the steady-state magnitude of the non-radiant heat losses (conduction and evaporation/convection), which will inevitably start “eating into” the radiant portion of the total as soon as a massive atmosphere is in place on top of a solar-heated planetary surface. At some point along the continuum – from 100 to 0 % – a balance will be struck. It simply depends on how effective the radiant vs. the non-radiant losses are at ridding the surface of energy at some particular temperature. This will vary from place to place on the same planet, as it will from planet to planet. The relationship between this steady-state ratio of heat losses and the steady-state surface temperature, though, is apparently not a straightforward (as in ‘linear’) one. Case in point, from the real Earth system: The total heat loss from the surface in the Sahara-Sahel and in the Congo are more or less the same, but the radiant portion of the total is much larger in the Sahara-Sahel (107 out of 174 W/m^2) than it is in the Congo (34 out of 174 W/m^2). This circumstance, however, doesn’t translate at all into a lower surface T_avg in the former region. You can’t just say that a region with a more effective (larger) surface radiant heat loss will necessarily end up having a lower T_avg than one where the radiant heat loss is much smaller. In fact, the surface T_avg is higher by several degrees in the Sahara-Sahel than in the Congo. You clearly are. You can’t seem to wrap your mind around cause and effect. The cause and effect is clear. The only change imposed on the system is the IR activity of the atmosphere. Given that is the only change, that is the only possible cause. It’s no different than the shell causing the core to warm. You seem to understand that, but you are apparently too stubborn to admit your errors on this problem. Your long-winded “counterexample” is not a counterexample at all. You can do the same analysis of the core-shell problem and the same time-dependent features appear. If you want, we can even make a more complicated core-shell problem with conduction between the core and the shell, a core that has an emissivity and reflectivity, and a shell than has emissivity and transmissivity. All of those details can be included. If you state that the shell caused the core to warm, then there is no getting around making the same conclusion for the atmosphere around a planet. The shell also has to increase in temperature just like the atmosphere. You clearly have not thought this through carefully. Here, why don’t you apply your arguments to the time-dependent solution for the steel greenhouse? This is the solution if it is assumed that the thermal inertial of the shell is negligible in comparison to the thermal inertia of the core. This is the solution to (a) and (b) above for all times. So, this is an example where you have claimed that the shell causes the temperature of the core to increase. It is also a detailed solution for a simplified case for your “counterexample”. In order to not get bogged down in semantics, why don’t we enrich Eisenbach’s steel greenhouse model and look at some numbers. We will still take the emissivity of the core to be 1 for all cases. However, we will partition the energy absorbed by the core and shell as 240-q and q, with q being the amount of energy absorbed directly by the shell. We will also allow the shell to have an emissivity other than 1 and an associated transmissivity. I will provide solutions for the case where the emissivity is 1 or 0, but I can provide solutions for others. We will also have “conduction” from the surface to the shell in the amount h (T_core – T_shell), where h is the conductivity. Here are solutions to such a model. If both the shell emissivity and the conductivity are zero, then the shell is in fact “thermally/thermodynamically disconnected from the core, and T_core is 255. Note that for all of the solutions with shell emissivity = 0, T_core = 255. Note that for all of the solutions with shell emissivity = 1, T_core > 255. Furthermore, adding conductivity, i.e. non-radiative heat transfer between the core and shell, causes the temperature to be lower than without conductivity. So, the only logical conclusions that can be made are as follows. Only cases with an emissive shell can CAUSE the core to increase in temperature. For ALL cases, adding non-radiative coupling between the core and shell CAUSES the core to either remain the same temperature or reduce in temperature. Hence, adding IR activity to the shell CAUSES warming of the core, and adding non-radiative coupling CAUSES cooling (or no change). These are hard numbers. Go ahead and provide your contorted interpretation. Just remember that you claimed that for the set in italics, you claimed that the CAUSE of that temperature rise was the addition of the IR active shell. No. The CAUSE of surface warming is the rising atmospheric temperature. The resulting atmospheric thermal radiation is but a (connecting) TOOL. And there’s a very simply way of showing why this is. #1 – A 2.7K atmosphere going from 0 to 100% IR activity. #2 – A 0.5-1% IR active atmosphere going from 2.7 to 279K. In the first scenario, the temperature never changes, while the level of IR activity increases from 0 to 100%. In the second scenario, the level of IR activity never changes, while the temperature increases from 2.7 to 279 Kelvin. What will happen in the two scenarios? In #1, the apparent atmospheric DWLWIR to the surface below will start at practically 0 W/m^2 (0% IR activity, 2.7K). However, it will also end at practically 0 W/m^2 (100% IR activity, 2.7K). Why is that? Because the atmospheric TEMPERATURE never changed. In #2, the apparent atmospheric DWLWIR to the surface below will start at practically 0 W/m^2 (0.5-1% IR activity, 2.7K), but it will rise to almost 345 W/m^2 at the end (0.5-1% IR activity, 279K). Why? The IR activity never increased, after all. No, but the atmospheric TEMPERATURE did! BTW, as you will notice, the final #2 scenario is simply equal to Earth’s actual atmosphere. Are you insane? The temperature changes in the atmosphere and the surface are the EFFECTS. This is what WARMING is referring to. A positive TEMPERATURE CHANGE is WARMING, a negative TEMPERATURE CHANGE is COOLING . You can’t identify an EFFECT that occurs WITHIN the system as an EXTERNAL CAUSE. You can turn the dial on CAUSES 1-4, and EFFECTS 1-7 will change. Hehe. No. You’re not reading, Rocky. It’s obvious you’re not here to have a discussion at all. You’re a textbook example of a dogmatically blinded cultist. It doesn’t matter what I write. You’ve just decided I’m wrong (and now ‘insane’, apparently), so you won’t bother reading it anyway. You’re just here to TELL me. How wrong I am. And what a stupid denier I am. It’s the same with all of you. Mindless barking dogs. That’s an interesting response to my unraveling of your lack of logic. It’s really quite simple now isn’t it? You’re trying to claim that an EFFECT is a CAUSE. Whether I am the one to tell you how wrong you are is irrelevant. That you are wrong is obvious. The fact that you resorted to ad hominem instead of addressing the argument is indicative that you are unable to form a cogent response. You can continue to claim that 1+1=3 until you are blue in the face. All that accomplishes is to demonstrate that you have no idea what you are talking about. No. YOU’RE trying to claim that an effect is a cause. YOU ARE, Rocky. You aren’t reading. You aren’t thinking. The change in temperature any part of the system can only ever be an effect. The same goes for any internal changes in energy fluxes. The temperatures and energy fluxes change according to established physics. The only things that can cause the temperatures or fluxes to change are the properties of the system and the external forcings to the system. I’m not the one claiming that a temperature change, which is governed by basic physics, is a cause. That’s basically akin to claiming that if you increase the SWR into the surface the cause of the increase in temperature of the atmosphere is the increase in temperature of the surface. You can say that if you want, but the fact is that the cause of the temperature change of the surface is the increase in SWR. The surface would have never increased in temperature if not for the increase in SWR, hence it’s the increase in SWR that is the ultimate cause, not the increase in temperature of the surface. The change in temperature any part of the system can only ever be an effect. Of course. But an effect OF WHAT? The radiative properties of that part specifically? It very much seems to me that you think matter simply needs to be radiatively active in order to warm, that its ability to absorb and emit radiation ITSELF somehow warms it and keeps it warm. Are you an idiot, or are you just pretending to be …? Temperature is of course a result of the net HEATING of matter. You know, when more heat enters than exits a system (Q_in > Q_out). Once the matter, through this process, AND through having the ability to STORE net energy internally, acquires a temperature above absolute zero, it in turn starts emitting thermal radiation. That thermal radiation, Rocky, is NOT the cause of the temperature that causes it. Only heat [Q] (and work [W]) heats. Photons from the cool air to the warm surface do not constitute heat. Just like photons from the warm surface to the cool air also do not constitute heat. I hope we can agree on this much. Cause and effect in a SYSTEM is not a difficult concept. If you change ONE property or external forcing in a system and leave ALL OTHERS unchanged, then the changes in the internal features of the system are the EFFECTS of that ONE CAUSE. That is your misinterpretation. This is why I have been trying to use quantitative models to keep this discussion focused. You have stated explicitly that the atmosphere needs to be IR active in order for the surface to have a higher temperature than the case where the atmosphere is not IR active. That is the case HOLDING ALL OTHER EXTERNAL VARIABLES FIXED. Hence, the IR activity is the cause. I think you mean “temperature change”. If so, yes, it can be. We could also have a change of state. Again, temperature can change under such circumstances. That says nothing of what the temperature changes from or to. I never claimed that the thermal radiation is the cause. I told you that the amounts of thermal radiation, like the temperature, were internal EFFECTS. The CAUSE was turning the IR properties on. The FIRST properties that CHANGES in this problem is flipping the switch on the IR properties. Temperature changes and energy fluxes follow. The ultimate SOURCE for all of the energy in these problems is the SUN (or in Eisenbach’s problem the internal nuclear source). Agreed, since heat is the NET transfer of energy. Photons from the cool air to the warm surface do constitutive a transfer of ENERGY. Do you agree with that? Yes, again this is one component of a bidirectional energy transfer. The heat transfer is the net of these two processes. Agreed? I agree that neither are heat transfer. That’s not what radiant heat transfer is about. It’s right there in the SB law. The heat transfer is the energy trnasferred from A to B minus the energy transferred from B to A.
I’m not talking in absolute terms here. I’m talking in practical terms. Like I said, the troposphere and the stratosphere are not hermetically sealed from one another when it comes to thermal interaction, but the average case heat flux exchange between them is so minor that it can essentially be neglected and we can practically treat them as two separate, thermally non-interacting (sub)systems of the Earth, the isothermal tropopause layer keeping them effectively parted; the lower one convectionally/advectionally governed, the upper one radiatively governed. Look, as soon as you put a massive atmosphere on top of a solar-heated planetary surface, what will happen is that some of the heat from that surface that used to go 100% straight to space (its ultimate ‘heat sink’) is now automatically drawn rather into the atmosphere (functioning as an intermediate energy reservoir), warming the atmosphere in the process. This will happen whether the atmosphere in question is IR active or not. The heat transferred from the surface to the newly introduced atmosphere, however, is not easily returned to the surface (convection vs. conduction), so will, for all intents and purposes, have to be shed from the atmosphere to space. And this can only happen via radiation. So in this case, it is clear that the atmosphere does need to be IR active. In order for it to be able to adequately COOL. Not warm, COOL. Turn on the IR activity of a warm atmosphere (heated by NON-radiative transfers from the surface) and it will cool, not warm. It’s as simple as that. # The surface could never become hot enough to drive convective transfer of energy to the atmosphere on top beyond a certain point, if this atmosphere were of the so-called ‘non-participating’ kind. This point is where the positive temp gradient developing during the night between the surface itself plus the air layer right on top of it and the bulk atmosphere above cannot be broken and turned into a steep enough negative gradient during the day, simply because the surface doesn’t have the time nor the opportunity to become hot enough – due to radiative heat loss. # In a hypothetical scenario with a radiatively inert atmosphere, you would thus end up with a planet – after a (steady) state of dynamic equilibrium is finally achieved – where the solid surface itself on average is MUCH colder than the bulk atmosphere above it, practically (!) all heat exchange between the surface and the atmosphere occurring within a shallow ‘boundary layer’ right at the bottom, the diurnally fluctuating top of which basically constituting a low-level ‘tropopause’, above it an isothermal, pretty hot, pretty thick ‘blanket’ of static air containing it. So, you are in fact wrong. You mean you are handwaving. Hadley cells are a result of the temperature differential between the equator and higher latitudes. Are you claiming that Hadley cells are “thin boundary layers”? The fact is that you are flailing here. Beyond what point? Convective transfer ALWAYS occurs if there are density gradients in the directions transverse to gravity, which is the case when going from the equator towards the poles. You are handwaving and not backing your statements with solid physics. You just make up BS and think it’s valid. Work the numbers. Only if the atmosphere is able to absorb a significant amount of SWR. Yes, then that is the case. That is in fact one of the examples that I gave above. The surface would ON AVERAGE be colder than the atmosphere in that case. Then, if you were to turn on IR activity in the atmosphere, that would CAUSE the surface to WARM. You mean you are handwaving. Yes, you’re one of those. You have nothing of substance, nothing even remotely related to the REAL argument at hand, so instead you harp on and on about irrelevant little details where you think you could ‘score a point’, in what is just a sad attempt at feeling somehow superior; you just HAVE to have the final word, no matter what it is. Bye, Rocky. You’re free to post here, but don’t expect me to respond to your extraneous, straw man drivel. I will respond if your comments address any actual points and arguments I’m making. So far I have seen no evidence whatsoever in what you have written here that suggests you have understood what is actually being said in the TP. I get the impression that you immediately assumed I was just another “climate change denier” somehow claiming that the “GHE” violates the 2nd Law (I’m not and I don’t), and then you started (and have continued) arguing against THAT idea rather than the ACTUAL argument being put forward. You shouldn’t rush to conclusions. Instead, READ, take in and think through what is being said … As of now, you’re not reading. You’re just asserting. One of those? Yes, I am someone that understands science. You claimed that an argon atmosphere would be “thermally/thermodynamically disconnected” from the surface. I called you out on this bit of nonsense and so you proceeded to move the goal post and claim that you’re “not talking in absolute terms” but rather in “practical terms”. Sorry buddy, but that’s just double speak for “yea you caught me but I’m not going to admit my error and instead will try to dissemble”. Well sorry, but your boundary layer discussion didn’t cut it. You completely ignored temperature gradients between the equator and the poles. Your comments on thermodynamics on this blog are as ignorant os your inability to discern the difference between cause and effect in the TP. You haven’t shown that in the least. You ignored your claim that the time dependent solution for the steel greenhouse problem is entirely analogous to your description of the atmosphere where you claim that the increase in temperature of the atmosphere is the “cause”. So why isn’t the increase in temperature of the shell in the steel greenhouse problem the “cause”? You get caught in your contradictions and you dissemble or dodge. That’s rather common among deniers, along with the long-winded responses that don’t actually address the arguments that prove you wrong. You don’t? But you do think that backradiation violates the second law. This is exactly what I’m talking about. No, I don’t. So you do believe that there is electromagnetic energy that is emitted by the cooler gases in the atmosphere that is absorbed by the warmer matter in the surface? Because if you do believe this, then I am not the only one who has misinterpreted your statements on the matter. Yes, I am a “believer”. You obviously mistake me for one of those people who think this is impossible. But the important thing here, which you insist on ignoring, is WHY do these gases emit thermal radiation in the first place? Hehe, that’s because you’re not the only one who doesn’t actually READ what I write; you simply assume that your PRECONCEIVED IDEA about what I should write (as a “denier”) is in fact what I write. Classic dogmatist behaviour. Thank you for the clarification. You comments on prior posts muddy this issue. For conditions where local equilibrium can be assumed, gases emit thermal radiation according to their temperature. Really? You wrote that a standing wave forms between two objects at equal temperature. You wrote that a cooler object radiates energy to a warmer object but does not transfer any energy to it. If you still believe this then you are wrong. You just admitted that cooler objects do emit photons that warmer objects absorb. That, my friend, is the transfer of energy from a cooler object to a warmer object. I DO read what you write, and I DO point out the contradictions. Your comments still do not address my actual argument, Rocky. They’re still nothing but ramblings. I’m waiting for you to show a sign, just one, that you’ve read and understood the actual argument being put forward in the TP. All I see is a string of assertions padded out by various ad hominem remarks of how stupid I am. OK, let’s address your argument. Furthermore, let’s put numbers to it with the enhanced steel greenhouse model (i.e. one with non-radiative transfer between the core and the shell). Look, as soon as you put a massive atmosphere on top of a solar-heated planetary surface, what will happen is that some of the heat from that surface that used to go 100% straight to space (its ultimate ‘heat sink’) is now automatically drawn rather into the atmosphere (functioning as an intermediate energy reservoir), warming the atmosphere in the process. Note that in the process of achieving this new steady state solution there was heat conducted from the core to the shell. So, it looks like we are in agreement on this first part of your statement. Let’s move on to the next. This will happen whether the atmosphere in question is IR active or not. This is a statement that lack precision. The processes that would occur with an IR-active atmosphere will proceed differently than those that would occur without an IR-active atmosphere. However, if all you are pointing out is that the atmosphere will warm from nearly 0K to a higher temperature, then yes, that will obviously occur whether the atmosphere is IR-active or not. The heat transferred from the surface to the newly introduced atmosphere, however, is not easily returned to the surface (convection vs. conduction), so will, for all intents and purposes, have to be shed from the atmosphere to space. This is a very qualitative statement. So, I am not sure how to evaluate it quantitatively. However, if the atmosphere is not IR-active then the second statement is incorrect. The atmosphere cannot shed any heat to space. In fact, the atmosphere doesn’t need to shed, on a net basis, any energy at all if it is not absorbing any energy from external sources. If the atmosphere is absorbing energy from external sources then at the new steady state it will transfer heat to the surface. That is this solution. So, the shell does not transfer any energy to space. And this can only happen via radiation. So in this case, it is clear that the atmosphere does need to be IR active. In order for it to be able to adequately COOL. Not warm, COOL. Turn on the IR activity of a warm atmosphere (heated by NON-radiative transfers from the surface) and it will cool, not warm. It’s as simple as that. Well, let’s see what the numbers say. Let’s take the first solution above and “turn on the IR activity of a warm atmosphere (heated by NON-radiative transfers from the surface)” and see what warms or cools. So the shell remains the SAME temperature, and the core WARMS. So turning on the IR-activity caused the core to WARM. Now let’s look at the second case where there is heat input to the shell. So the shell COOLS, and the core WARMS. So turning on the IR-activity caused the shell to COOL and the core to WARM. So, if all you have been claiming is that turning on IR-activity of the atmosphere CUASES the atmosphere to COOL and the surface to WARM (all with respect to the case where the atmosphere was already in place and in non-radiative steady state and the atmosphere absorbs some energy from a source), then we are finally in agreement. If you’d like I can provide time histories for either of these cases going from one steady state to the other. I can also change any numbers you’d like to look at different steady state solutions. I will note that the cooling of the shell in the second case represents the “atmosphere” above the surface, as the atmosphere in contact with the surface would warm. So in this case a more detailed model would be required to determine what warms and what cools. I think that we can probably agree that the upper atmosphere would cool and the lower atmosphere would warm in this case. If this is a case where you would like to discuss the details further, then I can come up with a multi-shell model to do so in a quantitative manner. The exponents of 0.5 and 0.25 were chosen in a rough attempt to account for convective interactions and can be changed if you like. These were also chosen to attempt to get numbers representative of Earth-like temperatures for the surface and different layers of the atmosphere. So, here are the solution for the cases with emissivities (again chosen to give approximately the correct LWR fluxes and an appropriate atmospheric window). I can provide all of the individual heat or energy fluxes if you want them. Now, how do these numbers change if all of the shell emissivities are turned off? So, turning on the IR-activity of the shells would cause the outer 2 shells (representing the mid and upper atmosphere) to COOL, and the inner shell (representing the lower atmosphere) and core to WARM. OK, let’s address your argument. Are you seriously this thick!? You say “let’s address your argument” and then go straight back to Eschenbach’s steel shell. MY ARGUMENT HAS GOT NOTHING TO DO WITH ESCHENBACH’S STEEL SHELL …! Stop it with the mindless straw man tactics, Rocky. Are you saying you haven’t got the faculties to follow the argument quite straightforwardly presented in the TP !? If you can’t apply your arguments to this simplified system where hard numbers can be applied, then there is a problem with your argument. Why is your argument not able to address what is going on in a multiple shell problem where the shells and core can interact non-radiatively? Your TP does not address the numbers for turning on or off IR-activity in the atmosphere. This model does. Are you able to understand and explain the physics at play here or not? The self-righteous dogmatist expects me – the one making the original argument – to respond to his straw man version of it rather than himself trying to address my actual argument. What you’re doing here is trolling, Rocky. You’re trying to draw attention AWAY from the actual argument being made. Address MY argument, or stop commenting. You don’t get to twist it into something it’s not. It’s called the Socratic method. I’m trying to get you to understand where the problems are in your argument with an example with hard numbers. An example where the basic physics can be solved and individual properties can be turned on and off. This IS about YOUR argument. If YOUR argument cannot address this simple problem than YOUR argument is FLAWED. The fact that you continue to avoid such an example where the numbers don’t lie is quite telling. I’ve addressed this already. If the atmosphere is IR-active, then this is true. I’ve addressed this too, although my first response concerning the lapse rate was due to misreading this. I’ve stated that this is true. It is also true that the shell in the steel greenhouse problem wouldn’t be able to make any difference whatsoever to the core temperature if the shell temperature were equal to that of space itself. But this begs the question, since you want to deal with you know REAL situations, of under what conditions would the atmosphere EVER be the temperature of space itself? It’s also true that even a 100% IR-active atmosphere wouldn’t make a difference if the temperature of the entire atmosphere were equal to the temperature of the surface. So, we’re in agreement on #1 and #2. I still stand by my initial response that this is irrelevant. I will give you the benefit of the doubt and agree that it is true. But again, so what? The exact same thing can be stated for the steel greenhouse. The shell has to be IR active and it has to have a temperature above that of space. Still (sort of) in agreement. That’s good. As I said previously this statement holds no meaning. If you want a technical discussion, then explain clearly what you mean by “insulating effect”, etc. When you use wiggle words like “effectively”, and I am unable to know for certain what you mean by that, then there is no common ground to begin from. This is why I am attempting to use a concrete model, governed by physics, and ask you to apply your explanations to the results. So, it would appear that we need to spend some time here so that you can explain exactly what you are talking about here. Ok, so this is where it begins. As I said previously this statement holds no meaning. How does it not hold any meaning? It is very clearly stated, and it builds directly on the previous points leading up to it. The atmosphere has to be warmer than space in order for it to be able to insulate the solar-heated surface of the Earth. Do you have a problem with the term “insulate”? Well, simply drop it and insert “elevate the steady-state average temperature of” in its place. Ok, so we’re looking for fundamental physical/material properties possessed BY the atmosphere that enable it to warm beyond the ‘temperature’ of space, and to stay that way. As required. AND for properties that specifically – on balance – DON’T. It is not clearly stated from a mathematical or scientific perspective. I told you that you are using wiggle words like “effectively” and you have not defined what you mean by “insulating effect”. Here is my definition of the “insulating effect” of an “element”, i.e. matter existing between to other entities a and b.
q_ab is the overall heat going into and then out of the “element” between a and b. Ta is the temperature at the interface between the element and a, and Tb is the temperature at the interface between the element and b. h(Ta,Tb) is then a quantification of the “insulating effect” of the element and can depend on the two interface temperatures. I can ASSURE you that the h(Ta,Tb) for the atmosphere DOES contain its IR properties. It’s not hard to understand. It’s hard for us to find a common language. AGAIN, that is why I have asked you to address the model problem where all of these effects can be QUANTIFIED. Your last statement is the problem. The surface and the atmosphere are a coupled system. You can’t look at one without considering the other. This is perhaps the crux of our disagreement. You can correctly claim that for a given state of the surface-atmosphere system then the net radiative losses from the atmosphere are positive. That’s fine. But so what? Here’s were you make a leap in logic in your next claim that is a non sequitur. For the steel greenhouse without non-radiative interactions, the radiative properties of the shell help to cool it to exactly the same extent that they act to heat it. So what does that mean? Your last statement is the problem. No, it simply points out what the ARGUMENT is about. It delimits it. If you want to make the surface budget a part of the argument, then you are CHANGING the original argument to suit YOUR counter-argument. You think and feel that this SHOULD have been part of the original argument, and thus proceed to argue against this preferred version rather than the actual argument. Look, if the argument is about the atmosphere and ITS ability to warm beyond the ‘temperature’ of space, then it makes no sense making the surface heat/energy budget a part of the argument. This is logic on a pretty fundamental level. The surface features in the atmosphere’s heat/energy budget as a heat source, just like the Sun. And space features as a (the) heat sink. Because the surface and the Sun are both warmer than the atmosphere, while space is colder. That’s how it works. The surface (and the Sun) transfers a macroscopic flux of energy (called heat, specifically heat IN) to the atmosphere, while the atmosphere in turn transfers a macroscopic flux of energy (also called heat, heat OUT) to space. So I very much “consider” the surface in my discussion. Just like I consider the Sun and space in my discussion. But the argument itself is about … THE ATMOSPHERE. You can correctly claim that for a given state of the surface-atmosphere system then the net radiative losses from the atmosphere are positive. That’s fine. But so what? Thermodynamics 101, Rocky. Q_in vs. Q_out. “(…) our atmosphere’s radiative Q_in is less than half as large as its radiative Q_out. On average, it cools more than twice as effectively via radiation as it heats via radiation. The non-radiative heat transfer mechanisms, on the other hand, only heat the atmosphere. They don’t cool it at all. On average. I thought the argument was about whether or not turning on or off the IR properties of the atmosphere with cause the surface to warm/cool. Disagree. Again, if we put equations to this argument and analyze q_ab = h(Ta,Tb) (Ta-Tb), then you might see the flaw in this thinking. The fact that the insulating properties of the atmosphere DEPEND on the surface temperature, i.e. h does depend on Ta, means that the surface is very different from the sun in this situation. The Sun is an external source to the entire system. The surface is interacting with the atmosphere in a non-linear manner. Again, we disagree and I provided a calculation that shows a counterexample. Turning IR activity on would cause cooling in parts of the atmosphere, i.e. upper atmosphere, and it would cause warming of the lower atmosphere near the surface. You’re hand waving and throwing around words. I am backing my statements with simple physical models and numbers. (Why? Because they are not working towards fulfilling the second requirement in point 3. They work strongly against it. On balance. And so, insofar as a shell’s radiative properties are not contributing positively to the net heating of that shell, they also cannot be CAUSING the shell to exert an insulating effect on the core. The statement just above for the core-shell model is for all intents and purposes identical to yours for the atmosphere-surface. Yet you claim that the IR properties of the shell are the cause of the core temperature. I’m sorry to say, but the insulting properties of radiative shields is a well-understood and established concept. Again, Holman’s Heat Transfer book goes to town on this concept. How is the atmosphere maintained at 2.7K? To do this there has to be some energy sink interacting with the atmosphere such that all of the energy that it absorbs from radiation is immediately taken away. So, Case 1 has this mysterious unidentified sink in operation. Case 2 is fine and can happen. The question is how is it physically possible that the temperature has not changed? You have an unidentified sink of energy in operation. You’ve redefined the system. The only reason that the temperature was able to increase in this scenario is because you don’t have your mysterious sink removing heat from the system. The atmospheric TEMPERATURE makes all the difference, not the level of IR activity. This is in contradiction to your prior statements that BOTH temperature AND IR activity are required. The problem for you placing primacy on temperature is that the temperature of the constituents is governed by the physics. It’s a response. Furthermore, a low temperature IR-active atmosphere will cause the surface to be warmer than with a high temperature non IR-active. So, if temperature makes all the difference, and not the level of IR-activity, then how can a low temperature atmosphere cause more warming than a high temperature atmosphere? It enables causation to occur. You mean that it is the primary cause of a secondary cause. Sort of like the ball is rising in my glass because it is floating on a rising water surface. The water surface is rising because I turned on the faucet. The first cause is turning on the faucet. The secondary cause is what happens to the system when the faucet is turned on. Yet you claim that the IR properties of the shell are the cause of the core temperature. Mmm, no. More misrepresentation. I claim that the TEMPERATURE of the shell is the cause of the (elevated) core temperature. The thermal radiation (a direct effect of that temperature; it’s in the name itself, after all) simply carries the temperature signal. Your two scenarios are not based on relevant physics problems. Hahaha! Naturally, in your head they’re not. Of course they’re relevant scenarios, Rocky. Hypothetical, yes. But highly relevant. Because they specifically isolate the difference between the two phenomena when it comes to their individual ability to cause a change in apparent DWLWIR. What happens if we change the atmospheric IR activity level from 0 to 100% at constant temperature (2.7K)? Versus, what happens if we change the atmospheric temperature from 2.7 to 279K at constant IR activity level (0.5-1%)? In what scenario does the apparent DWLWIR increase? And in what scenario does the apparent DWLWIR not increase? See if you can answer this honestly. Hehe, no, I’m simply assuming that the atmosphere has radiative properties and nothing else. Hypothetically. To isolate the effect of those particular properties from everything else. Got it? Absorbing and emitting IR is itself a zero-sum game. To turn it into a NON-zero-sum game, we need something ELSE, some OTHER property of matter introduced. Something that can enable the matter to hold on to absorbed energy rather than just letting go of it right away. The question is how is it physically possible that the temperature has not changed? Because we’re assuming only radiative properties/processes are in operation. Are you seriously not getting this …? Exactly. Because now we have OTHER properties of matter besides the purely radiative ones introduced …! This is in contradiction to your prior statements that BOTH temperature AND IR activity are required. Er, no. Because i JUST showed you how changes in IR activity in themselves, with temperature present, but unchanged, make no difference to heat flows, while changes in temperature, with IR activity present, but unchanged, do. THAT’S how we see which one is the CAUSE (the “engine”) and which one is merely a connecting DEVICE (the “clutch”). (…) if temperature makes all the difference, and not the level of IR-activity, then how can a low temperature atmosphere cause more warming than a high temperature atmosphere? There’s no need to try and turn this into something more difficult and intricate than it is, because it really is very simple. There is naturally a cause behind atmospheric temperature. No one’s saying the atmosphere’s temperature is somehow “causeless”, or “causing itself”. The atmosphere has a temperature above that of space because 1) it was/is heated, and 2) it holds physical properties enabling it to warm and stay warm. As I’ve explained. Ad nauseam. But we’re not talking about THIS cause, are we? We’re talking about the cause of elevated SURFACE temperatures as a result of the atmosphere’s insulating effect on it. And in THIS case the atmospheric temperature being above that of space is indeed the cause, and the atmosphere’s thermal radiation merely the connecting tool, being itself controlled by (an effect of) the atmosphere’s temperature. Is it safe for me to assume, now, Rocky Squirrel, that your real name is Tim F******s? An what caused the temperature of the shell to change?